Powerful automatic lettering, customizing and machine connection software for non-digitizing staff in a retail embroidery shop or production facility. Combine lettering with resizable logos or stock designs. Automate repetitive jobs with the Team Names feature and automatically send stitch files to the embroidery machine. EmbroideryStudio Update e4.1Q AVAILABLE NOW! 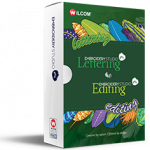 Wilcom’s EmbroideryStudio e4 Lettering is powerful automatic lettering, customizing and machine connection software for non-digitizing staff in a retail embroidery shop or production facility. If you outsource your embroidery digitizing, nine times out of ten, your contractor will use the Wilcom EMB file format. Why not streamline the process by using the same software so that you can easily edit the designs without losing quality or stitch data? Improved quality of automatic TrueType/OpenType stitching. Speed up production and don’t waste time manual handling of team names! Mail-Merge style features import a list of names, auto-fits them to your baseline and outputs for either single or multi-head production. Create a matrix layout of multiple team names in large frames. Use embroidery fonts or TrueType fonts. A design created for a towel can now be stitched on silk scarf with Auto Fabric Assistant. This tool automatically applies the most suitable underlay, pull compensation and stitch density settings for your chosen fabric. Optimize your production with full control of underlay, pull compensation, connectors, tie ins/offs, trims, jump and stop machine functions. You can even edit individual stitches to address any problem areas. Stitch Manager, Machine Manager and Connection Manager give you all the options to make sending designs to production a snap! You can also edit machine format values to get the best results. 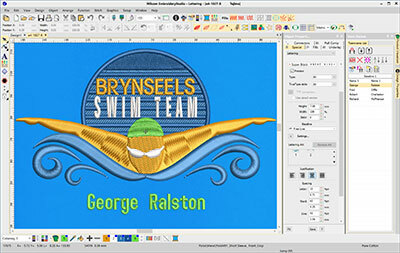 Why Update to EmbroideryStudio e4 Lettering? With the long anticipated release of EmbroideryStudio e4, there has never been a better time to update your Wilcom software. There are many reasons why keeping up to date with the latest technology is important. Firstly, ensure your business doesn’t suffer when your old computer crashes and it’s time to replace it with the newer hardware and operating software. You don’t want to be caught with any downtime. Not just that, but the latest EmbroideryStudio is so much more powerful that it runs faster and comes with both online and personal support. Wilcom is famous for quality lettering. Use any of the 200+ pre-digitized fonts for speed, precision and zero thread breaks! You can also convert any TrueType and OpenType fonts with ease. Improved quality of automatic TrueType / OpenType stitching. “Open Recent Designs” with thumbnail view. No need to worry about dongles going missing, if you have several operators using Wilcom software they can now be purchased and installed with just one Network security dongle. Please ensure you have the correct hardware to ensure the software runs well. EmbroideryStudio e4 is compatible with Windows 7, 8 and 10 operating systems. The following are the minimum and recommended system requirements for EmbroideryStudio e4. Barudan – This format is used for many Barudan machines. It supports up to 9 needles. The Barudan format is suitable for paper tape, FMC disks, and the DSB file format. Barudan Chenille – This format is used only for the older BELM – A3C series of Barudan Chenille Machines with 5 Chenille colors. Newer models use Barudan FDR-II Chenille Combination. Barudan FDR-II Chenille Combination – This format is used for newer models of Barudan Chenille machines supporting 6 chenille colors such as the BEDYH and BEDSH. Using this format, you can digitize pure Chenille or even a combination of Chenille and Lockstitch in the one design. Barudan FDR-II Lockstitch – his format is currently used for BED* series lockstitch machines and is the standard for all new Barudan lockstitch machine models. It supports up to 15 needles and optional sequin attachments. Barudan FDR-II Twin Sequin – This is a Barudan twin sequin machine. The design needs to be digitized using this machine format for it to run on Barudan machine with a twin-sequin attachment. Barudan FDR-II Twin Sequin Chenille Combination – This is a Barudan twin sequin and Chenille combination machine. The design needs to be digitized using this machine format for it to run on Barudan machine with a twin-sequin and chenille attachment. Barudan Z Series – This format is used for Barudan Z series machines with 10 or more needles. Inbro – This format is used for main types of Inbro machines. Melco – This format is used for main types of Melco machines. Melco Chenille – This format is used for Melco-enabled Chenille machines. Pfaff – This format is used for main types of Pfaff machines. Schiffli – This format is used for Schiffli machines. SWF – This format is used for main types of SWF machines. Tajima – This format is used for main types of Tajima machines. Tajima TBF – This is used for Tajima needle addressing capable machines. TBF (Tajima Binary Format) file format is a more intelligent machine format which holds needle addressing information. The design needs to be digitized using this machine format for it to run on Tajima machines with a twin-sequin attachment. Tajima TMCE-100 – This format is used for Chenille-enabled Tajima machines. Tajima TMCE-600 – This format is used for Chenille-enabled Tajima machines. Toyota – This format is used for main types of Toyota machines. Zangs – This is the format for Zangs and Marco brand machines and pre-1988 ZSK machines without trimmers. ZSK 1 – This format is for ZSK machines that have 7 or fewer needles – generally those older than 1991. ZSK 2 – This format is for ZSK machines that have more than 7 needles and those characterized by a single-top thread trimmer. ZSK TC – This format is for ZSK machines that accept Transport Code Disks (DOS format disks). Helpful hints and tips on connecting your Wilcom software to your machine can be found in the User Manual provided with your software.